As promised, I have a winner for last Friday’s giveaway of the sketchbook, pitt pen and pencil case and it is patti a . You should have an email and I will drop it in the mail as soon as I receive your address. The two on the left are perle cotton, 2 embroidery floss and the 5th one silk. 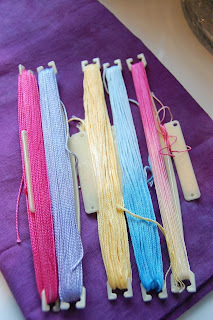 Very pretty and I loved dyeing the embroidery floss. 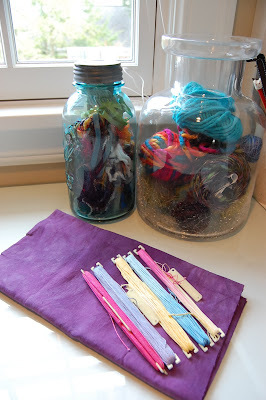 I will leave them on the little holders and you can pop them in your dye the next time you do fabric dyeing. Just enter your name on THIS post and let me know if you set weekly goals for your art or you just let it happen. I will pick a winner next Friday . Thanks for all those who got me through one of my first (ok maybe second or so) artist’s crisis. I have returned to smiling and moving forward. Be creative, my friends! And have a good weekend. This entry was posted in blogging on November 12, 2010 by Colleen Kole. To blog or not to blog. It takes time and you must have something to show and something to say. It takes time to make it look fresh. Should you keep doing it or just spend the time to make art? I have enjoyed this process. But my blog is kind of stale and not so fresh looking. So with a committment to improve this blog, I signed up for a self-study class with Allyson Stanfield and Cynthia Morris. For my first assignment, I need to define why I blog and who my readers are. Thus, the giveaway this week to bribe you to keep reading while I try to define myself and my goals. But that wasn’t even very exciting for you… so I guess I have to do the homework. Readers: Anyone who is interested in making and creating using fabric, needle and an imagination. A reader who enjoys seeing fiber arts and the process of creating them. No specific age or geographical location. Willing to watch me try new things and try them with me? May feel comfortable leaving a comment or asking a question. Reason for blogging: I want to record my journey as an art quilter and push myself to share the joys and frustrations of the process. I would like to show you what inspires me and hopefully inspire someone else to be creative. It has grown into a means of meeting and connecting with other artists and friends. Homework done. Off to sew for awhile. Working on the blue beast from last week that I actually showed you. Persistent in solving the problem. Be creative and please someone leave a comment to win a new sketchbook – I am feeling really silly right now. This entry was posted in blogging on November 9, 2010 by Colleen Kole. I can’t believe I missed this. I have been blogging for more than a year now. I looked back and this is my 170th post and I started last October. I remember how hard the first post was. I had a million excuses. I don’t know how to use the technology I might need. I have awful pictures. What would I say after the first few posts? Would anyone really care? Do I really want to be an artist ? Would others really care about hearing about all my mistakes and this journey? Do I know anything that might inspire someone else? Well I figured out , in the end , I am just a gopher. ( Not an artist yet :). I need to stick myself out of the hole- a sometimes lonesome hole because I usually work alone-and see if anyone is out there. I love reading what you are doing. Thus, my blog list. Is anyone doing the same thing I am? Whether it be dyeing fabric, designing or just making something else fun to see. I am inspired beyond belief by others and I enjoy how freely others share their feelings and their process. I have done this, not only to share what I have done, but for the connections made. I thank you so for the new friendships I have made. I couldn’t have believed a year ago I would have met so many new friends through blogging. And had an opportunity to meet and share their journey. I have re-connected with old friends and been able to share in their successes. Great big tears of joy I have cried for them and they don’t even know it because they can’t see me.I love seeing what their hands and mind have created. How sweet is their success when they have worked so hard. And I was able to share in it because they shared through their blogs. Thank you for putting up with my awful pictures, my poor grammar and my, often, unedited posts. Thanks for your technology advice. Silly, silly girl that I am! Most of all, again thanks for your friendships and taking time to read out of your busy day. Guess I need to learn to say instead of “I can’t do this” , “I will do this “. Be creative, my friends! I better think of a giveaway to celebrate. This entry was posted in blogging, inspiration on November 3, 2010 by Colleen Kole.